At a busy mid-valley station on Friday: apparent self-service in action. Whether the bill does become law is hard to say. The Joint Committee on Transportation held a hearing on the bill on March 20. But there seemed to be little interest. Only three people including the sponsor testified for it, and another legislator testified against it. The hearing room was all but empty. The committee has scheduled no work session on the bill. Unless one is scheduled pretty soon, the bill is probably dead. In the past two sessions, the legislature loosened the ban on self-serve gas for counties in eastern Oregon. There, in counties with 40,000 or fewer residents, self-service is now allowed 24 hours a day. The Oregon ban on gasoline self-serve dates from the 1950s and was justified on grounds of safety. Pumping gas is supposed to be risky, according to Oregon law, and only trained people are supposed to do it. New Jersey has a similar law. But the reasoning is plainly nonsense, as millions of people in the other 48 states and around the world demonstrate every day. 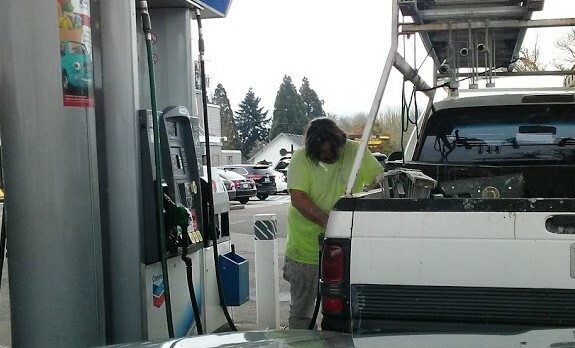 Already in Oregon, motorcyclists are allowed to pump their own gas. So are customers of card-lock stations. Oregon has no good reason to ban it for the rest of us. Still, why mess with this law, silly as it is? The transportation committee was told that in opinion surveys, Oregonians are split almost evenly for and against maintaining the law as it is. Sen. Brian Boquist, R-Dallas, a committee member, called the bill a “wonderful compromise” between both views. Stations owners would have to to keep attendants, but they could — but would not have to — allow self-service at up to 25 percent of their pumps. There is a bright side to these dumb gas pumping laws. There is no consequence to the consumer who breaks the law and pumps gas illegally. The gas station can be fined by the State Fire Marshall up to $500 per illegal use of a pump. No doubt there are undercover Fire Marshall’s skulking around at gas stations in Albany checking for illegal pumping. The “revenue” they generate goes into the Fire Marshall’s general fund. So go ahead and pump your own gas without fear of the coercive State of Oregon. Let the corporations who make obscene profits off you deal with the State. O gracious! Make me get out of my comfortable, heated seat to stand in the rain to pump my own. I might miss connections on my cellie, I can’t hear the tunes on Sirius. While eating my bagel & sipping a $4.50 coffee for the rest of the trip I’ll have that nasty gas smell on my hands. Wait…have plastic gloves available at the pump. Yep, more plastic! Then there is the danger of pulling away w/o disconnecting the nozzle (happened more than once at the County fueling station!). As someone who has actually lived in states that allow consumers to pump their own gas, one of my absolute favorite things about Oregon is that I don’t have to get out of my vehicle to fuel up. Knowing Salem, it’s all about the Benjamins. They’ll argue that with decreased labor costs, the price per gallon will go down…and it will, until Brown and the rest of the clowns vote in a new gas tax. But the problem with that is that the folks who lost their jobs won’t be buying gas…or anything else for that matter. Talk to the Californians about what a myth/lie they try to sell to the public about how it will reduce the price at the pump for gas. It never happened. It isn’t worth it. People may think self serve is faster, sometimes it is. Still it creates jobs to have attendants at the pumps. I don’t like pumping my own gas and I have seen enough videos of fools who drive off with the nozzle still in their gas tank, and standing outside smoking while pumping their gas to say there is some validity to the safety issue. I think having some patience at the pump is not too big a price to pay to let the attendants keep their jobs and let little old ladies stay in their cars. Anytime a legislator (Boquist) tells you a bill is a “wonderful compromise” it’s time to check your wallet’s still in your pocket. If you want to pump your own gas, move to California. I like pumping my own gas because I don’t drop the gas cap after removing it, letting it bounce against the side of my vehicle. I hang it on the provided tab in the gas door. Thankfully, the ban on “topping off” has reduced the potential for gasoline running down the side of my vehicle, but I remember those days as well. I even remember the “service station” where you could get your windshield washed while you waited. That’s been awhile. Now I’m just sure to go somewhere that’s proven themselves reliable to do it thoughtfully and that avoids the person in front of me at the pump screwing something up. I think this is an insane idea and hope the bill never gets out of committee! I read these comments and have to wonder if you people know how to read… The complaining about pumping you own gas is weird, considering the article plainly explained that the bill would only make 25% of pumps self-serve if wanted. Also, as for people saying it wouldn’t be much faster… HOGWASH. Maybe in Corvallis and Albany the time advantage is negligible, but up in Portland it would be huge. I lived in NJ for years, and the difference in wait times between PA and NJ at gas stations was huge. People near the border would routinely gas up in PA for that very reason. It makes a huge difference when you have large volumes of cars. Lastly, why does anyone care if someone at the gas station is pumping themselves? Go get your full service gas and let us pump our own. How is it affecting you? Now, I agree that they should not get rid of full serve (elderly, handicapped, and people who just don’t want to pump should have the option)… but why are people so against offering both? P.S. – Anyone bringing up safety issues… Come on, as the article states I think with 48 other states doing self-serve for over 50 years I think people know how to do it.